Did you all watch the premiere of Mad Men? I have to say I’m very excited for the ’60s fashion possibilities. Aside from that great insight, I’m too pleasantly exhausted right now to share anything remotely thought-provoking, but I promise my next post won’t be so content devoid. Hope you all enjoyed your weekends! The colors in your look are so striking and lovely! What a lovely color and pattern combo here missy! You look just sweet as pie. Missed Mad Men, but I am not much of a TV person. I can say, though, that the style that is born through the show I just adore! Beautiful spring-ish look!I truly fell in love with those gorgeous sandals! ok you did it again. effortless quirky sheeck. i love the way you combine all you wore…adoreable! 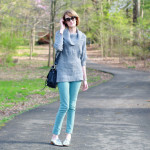 I love that sweater, the print and color mixing in this outfit is great!!! I like orange and blue together, very nice styling. Saw you featured on Refinery29 today girl! Looking amazing! Love your cardigan! Your outfit is so pretty. I didn't watch the premiere of 'Mad Men', I don't have the channel it airs on so I will have to wait until it comes out on Netflix or illegally download it! Amazing shoes and necklace! So spring chic for sure. OMG your shoes! So fancy and so awesome! They look amazing with your outfit. Lovely pattern mixing, and those shoes are to die for! Wow, you look striking. I love how you pair brights peices with prints. Suite! I love the mixed prints and pleated skirt! Gorgeous!! Your pictures are always beaming with this lovely delicateness~ I don't know how to describe it, but they're always so peaceful and refreshing to look at! Your pleated skirt is so pretty and such a perfect match to that top. I adore your necklace, too! Love your pattern sweater. You are such a 60's doll. I love watching Mad Men. Lovely mix of the prints! I love your skirt, wonderful color!! You have such a wonderful blog…I'm now a follower! You've done a great job in mixing this look, love love the mix. You look stunning beautiful. I'm working through the older seasons of Mad Men on Netflix! I think I'm on like season 3. I love it!! Your top is super pretty. From a distance it almost looks textured, like its made from chain or something. The night after the premiere aired, the "Zou Bisou Bisou" song was the soundtrack to my dreams. I couldn't get it out of my head! Also, I love how the trendiest girls are Megan and Ken Cosgrove's wife – everybody else is still sporting Jackie Kennedy hemlines. I am loving your chic bob! very fitting for your 60's inspired look! Adore this look. The colors and pattern mixing is divine! great colors. love the pleated skirt. i am completely in love with this look, the mixed prints, the soft pleats, the bright colors…. perfection. love the mix of prints/colors…all is divine, as usual! Those sandals are AMAZING. Ohh, they are so pretty and look so stunning with your lovely coat. ok, so this has to be my favorite outfit of you yet!! love it!! the mix of prints and texture, i'm inspired!